It needs to be understood that Russia views the EU and the West generally as an enemy. To say this is not Russophobia. It has been made clear in countless official Russian documents, to say nothing of their routine pronouncements, propaganda and actions. Nor is it something new. There were periods of East-West hostility during the 19th century, and it has been running for most of the last hundred years through quite extensive changes in the make-up of the opposing teams and the issues ostensibly being fought over. There have been, of course, a few intermissions when the Kremlin was happy to reach an accommodation with the West, most notably perhaps during World War II and in the Gorbachev era. Even before the Bolsheviks institutionalised the stand-off for decades to come, there were successive waves of love and hate towards the West within Russian educated opinion, in the form of the long struggle between the Westernisers (zapadniki) and the Slavophiles, a pendulum that in a small way keeps swinging even under Putin. Pretty much from the outset of his ascendancy, Putin has progressively instituted a familiar Kagebeshnik (KGB officer) tyranny, if displaying signs of creative innovation, with the West and especially the US featuring as the bogey man externally and the main pretext for domestic repression. Western apologists for Putin periodically express concern that the West is in danger of slipping into a new Cold War. But in fact, Moscow has been in Cold-War mode for at least a decade. Western Putinists warn their insouciant leaders that they risk precipitating a nuclear war. But in fact, it is Russia that in recent years on countless occasions has made use of nuclear intimidation as a tool of so-called hybrid warfare against its Western adversaries. A prime cause of Western weakness in the face of Russian pressure has been the gross disproportion between Russia’s knowledge and understanding of the Western target, and the West’s limited and distorted grasp of Russia’s objectives and its strategies for pursuing them. Since the Russian war against Ukraine, that imbalance has begun to correct itself to some degree. But we continue to lag far behind Russia in our understanding of the adversary, our resolve and our capabilities of all kinds: military, cyber, espionage, propaganda, decision-making and more. For its part, Russia has greatly expanded its tools and programs of hybrid warfare against Western targets, as well as against former vassals who have escaped and wish to defend their sovereignty against Russian encroachments by seeking the closest possible engagement with Western institutions, above all the EU and NATO. The central message is that Russia is winning. Its war against Ukraine did not turn out as ideally as it had hoped, but it has inflicted severe punishment on Kyiv, which will serve to keep it in constant crisis and make others hesitate to resist Russian demands. The Minsk ceasefire has been a myth since it was reached. The Ukrainians have fought bravely with inferior equipment, but they are defending the stalemate imposed upon them, one which is neither diplomatically nor militarily stable. Ukraine's economy and polity are both under incessant and severe pressure. And no one seriously expects Russia to withdraw its forces from the Donbas. If anything, at some propitious moment of Western weakness or hybrid triumph, it seems distinctly possible that Russia will push forward again to seize additional territory and control. In Belarus, Georgia and Moldova, the situation does not favour the pro-Western forces, partly because of their own poor performance. In addition, Belarus under Lukashenko seems only interested in flirting with the West when his personal autonomy is at risk from Russian pressure. Retaining independence over the longer haul will continue to be difficult for all of them. Meanwhile, Armenia has largely given up the attempt to strengthen its Western links, and Azerbaijan is drifting more towards Moscow. In Syria and the Middle East more broadly, Putin has made huge gains in the last couple of years. This could have very negative consequences for Western positions on a number of fronts, including limiting the capacity of NATO to operate freely in areas close to member states. Despite his sponsorship of Shiite aggression led by Iran in the region, Putin has adroitly co-opted the Sunni Erdogan to his dictators’ club, and has managed to engage successfully with Sunni leaders in Riyadh and Cairo on the oil price and anti-US tickets. In the former Yugoslavia, Russia for some years, but with increasing intensity lately, has been behaving as though bent on restarting the Milosevic wars, the wars of the Titoist Succession. This is an incredibly destructive policy but typical, unfortunately, of those launching it. The Bosnian Serbs are being encouraged to pursue secession, the Serbs of Serbia are being encouraged not to give up on the more than 90% of the Albanian province of Kosovo, and also to host dubious Russian facilities. Moscow seems to have undertaken not just propaganda and subversive penetration of Montenegro, but also an armed coup possibly aimed at murdering Montenegro’s longtime pro-Western leader, Milo Djukanovic. The coup failed, but illustrates the techniques and strategic objectives of Moscow’s hybrid warfare tactics nicely. Russians have bought out much of the best real estate in Montenegro and have strong influence in its politics. But to Moscow’s fury, Podgorica has nonetheless now joined NATO, a sign of a growing awareness of the threat and capacity for timely decision-making by the West. Putin’s objective in Montenegro would have been, inter alia, to create another anti-access and area-denial bubble, as in Syria and elsewhere, to limit NATO freedom of manoeuvre in its own region. Russia is also looking to oppose the West in the troubled state of Macedonia, which but for the Greek veto, might by now have achieved greater progress towards European integration, which it has long sought. Much more could be said about the above. But Putin is also pressing his hybrid offensives brazenly into Western heartland territories, not just in areas which are in dispute between East and West but aiming at the key pillars of the West and their increasingly volatile and unedifying electoral cycles. 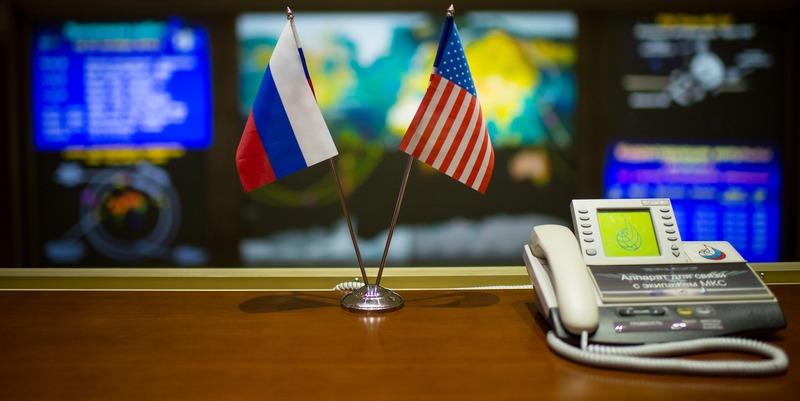 Most spectacularly of all, Russia has intervened visibly in the US presidential elections. Robert Manne’s article on the Trump camp’s complicity with Putin’s regime is worth revisiting. And here’s my own take. Since Manne and others wrote, the evidence has, to put it at its most minimal, not diminished. President Trump has just completed a triumphant tour of key Western allies, publicly declining to confirm US commitment to Article 5 of the NATO treaty and leaving them all in a state of dismayed demoralisation. Their leader, Angela Merkel, has said that Europe can no longer rely on its US ally. David Frum has tweeted that since 1945, the supreme strategic goal of Moscow in Europe has been the severing of the US-(West) German alliance. ‘Trump delivered’. Both before and since the Trump electoral victory, we’ve seen multiple signs of mendacious Kagebeshnik insertions into other Western contests, most notably and recently the Dutch, French and German elections. In the French presidential election, three of the top four candidates were overtly pro-Putin and anti-sanctions. If any of the three (lunar right and lunar left, with the curiously Putinophilic Fillon in the middle) had won, there would have been more champagne corks popping in the Kremlin. Fortunately, though quite fortuitously, Macron saved the French, as well as the rest of us, despite helpful interventions from totally unknown sources declaring him a homosexual, and hacking attacks just before the vote. It is also worth noting that Marine Le Pen, who has received Russian money, has been repeatedly red-carpeted in the Kremlin, receiving a papal blessing from Vladimir Vladimirovich himself before the contest. What all this illustrates is the brilliant success Putin has had in the last five or six years in courting not only the hard left throughout the world (despite presiding over the most inegalitarian country in the more-or-less-developed world), but also the hard right. In addition, it demonstrates the effectiveness of his neo-Stalinist 'active measures' and propaganda in exploiting the primitive populism and lack of quality control in contemporary Western election processes. The dismal weakness of Western strategic decision making, starting at the top with POTUS himself, seems every bit as threatening to our future as Putin’s aggressive policies. Photo by Flickr user NASA HQ PHOTO.